A terracotta statue of Henry Fawcett, which was unveiled on Wednesday 7th June 1893 by the Archbishop of Canterbury in Vauxhall Park, mysteriously vanished in late 1959. It was designed by the celebrated Victorian sculptor George Tinworth, and donated by Sir Henry Doulton. The statue has not had a confirmed sighting since its disappearance, and its current condition and whereabouts is the subject of a number of myths. 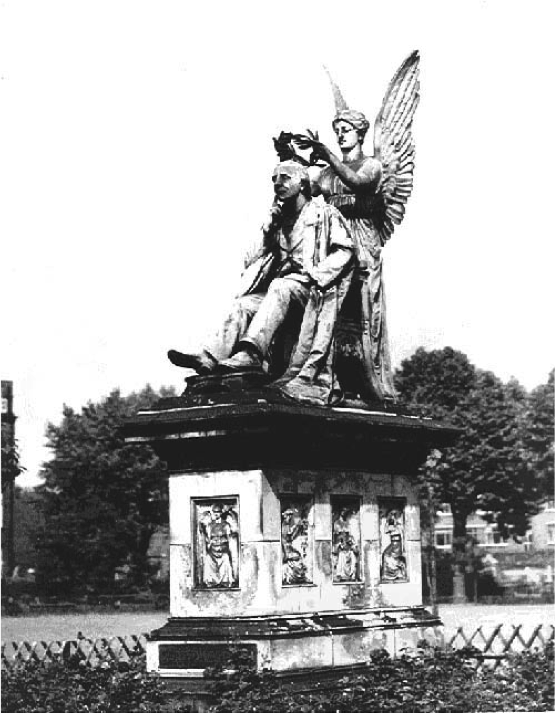 The statue was not only a memorial to the life and work of Henry Fawcett, but marked the site of his former home, which was demolished to create Vauxhall Park. Henry Fawcett was an economist and politician who was held in high regard by the public. He was born in 1833 and educated at the University of Cambridge. At the age of 25 he was involved in a shooting accident that left him blind. However, he refused to let his affliction dampen his life and ambitions. 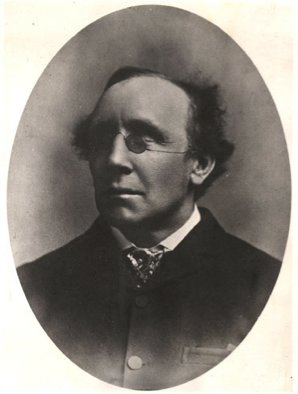 He rose to become a Professor in Economics at Cambridge University and was elected Member of Parliament for Brighton in 1865 to 1874, and subsequently for Hackney in 1874 to 1884. In 1880 he was also appointed the position of Her Majesty’s Postmaster-General. He introduced improvements in the Post Office such as the parcel post, postal orders and sixpenny telegrams. He was also an avid supporter of women’s rights and encouraged the Post Office to employ women. He married the renowned suffragist, Millicent Fawcett, in 1867. Both Henry and Millicent were also devoted to the cause of the poor and the preservation of commons and open spaces for public enjoyment, and it was whilst they were living at number 51 Lawn House in Vauxhall that this devotion turned closer to home. Lawn House, as it was so aptly named, came with a substantial garden in which the Fawcetts could relax and enjoy the open air in London. But they soon realised that due to the increasing industrial nature of Vauxhall in the 1880s, open land was rapidly disappearing. Two years after Henry’s death in 1886, Millicent and her friends, including Octavia Hill, campaigned for a park to be created on the site of Lawn House that could be dedicated to Henry’s memory. On obtaining permission from the Lambeth Vestry, Lawn House was demolished to make way for the Park. Octavia Hill, who is perhaps best known as one of the associated founders of the National Trust, was also the treasurer of the Kyrle Society at the time, which aimed to bring open spaces to the lives of the urban lower class. The Society paid for the park’s design, which was carried out by the landscape gardener Fanny. R. Wilkinson. The Victorian and Edwardian architect Charles Harrison Townsend designed the entrance gates and railings. The park was officially opened by the Prince and Princess of Wales, the Duke of Edinburgh, who was also president of the Kyrle Society, and Princess Louise on Monday 7th July 1890. The monument, including its case, rose to roughly sixteen feet high. It was executed in terracotta, a material that had gained popularity in the last decades of the nineteenth century. Henry was depicted seated, in an ornate chair, wearing the academic robes of a Professor at the University of Cambridge. He was about to be crowned with a wreath of laurels given from the figure of Victory, which was likely present to represent his victory over his affliction. The base contained eight separate bas-relief sculptures that depicted symbolic moments in Fawcett’s life and career. Depictions of courage and justice, two attributes that were well associated with him, were situated on the back and front of the base. Truth and sympathy were also located on the side panels. The remainder of the relief panels were more closely related to his career. His work within the Post Office was represented by a female Post Office clerk. He was also championed for the reduction of the price of a telegram, which was depicted through the relay of good and bad news. The final panel portrayed India, which referenced his instrumental involvement in the appointment of committees to Indian finance, through which he became publically known as ‘Member for India’ in parliament. His admiration was also echoed in the inscription, located on the front of the base, which was the same as the inscription on his memorial located in Westminster Abbey. Tinworth was employed at Doulton’s Lambeth factory for much of his working life. The majority of his sculpture consisted of terracotta relief panels, which often depicted religious scenes. Though the memorial included some of these typical relief panels, the subject, as well as the carved life-size figures, were a rare example of his varied sculptural ability. The memorial to Henry was one of only three men that George Tinworth is known to have modelled life-size figures on. The statue, unlike so much other public art, survived the World War Two bombing raids on London, only to disappear from the park ten years later in 1959. As stated, myths have grown around its disappearance. One story suggests that the memorial was dismantled and moved to Salisbury, Henry’s birthplace, yet no trace of it can be found. The Council, speaking to South London Press in February 1959, insisted that neither the bandstand nor the statue were appreciated. They claimed that to ‘knock down’ the statue and replace it with open space accompanied by a footpath would enhance the park. The cost of removing the statue and the bandstand was five hundred and ninety pounds. The memorial also appeared in the popular British film Look Back in Anger in 1959, which was based on John Osborne’s successful play. The discussion of the statue and its appearance in the film suggests that it was in fact the Council who did not appreciate it, and perhaps the cost of upkeeping it, rather than the general public or artistic community. Another myth, which has perhaps gained the most popularity, tells us that the headmaster of the nearby Henry Fawcett Primary School was walking through the park whilst the statue was being demolished and salvaged the head to display in the school. However, on closer inspection, there are subtle differences between the head located in the school and that on the lost statue. Research into the school’s piece has revealed that while it does depict Henry Fawcett, it was modelled by another Victorian sculptor, Henry Richard Hope-Pinker, who also executed a statue of Henry that stands in Salisbury Market Place. The bust was originally a plaster cast that has since been bronzed and is an exact match to one held by the National Portrait Gallery, which was donated by Hope-Pinker in 1905, Fig. 4. 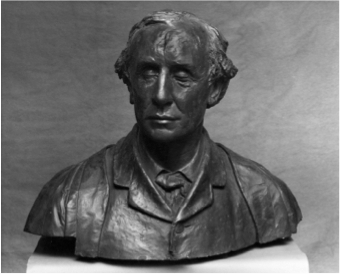 Hope-Pinker is known to have sculpted at least one other bust of Henry Fawcett, which was sold at auction in 2008. He typically carved without a model, and preferred to work from life or from drawings. It could, therefore, not be at all coincidental that his bust of Henry bears a remarkable similarity to the photo of him seen in Fig. 1. The careful phrasing in the Council minutes could lead one to believe that the memorial was simply ‘removed’ and rehoused. But given that the myths have proven to be false, and no part of the statue has been identified since its disappearance, it looks increasingly likely that it was completely knocked down in 1959 as the South London Press recorded. All that remains on the spot of the irreplaceable statue is a plaque that records the site as the Fawcett’s former home. Today, it would have undoubtedly been a celebrated public monument and a testament to George Tinworth’s artistic talent and use of terracotta. It would most likely have joined two other public statues that depict Henry Fawcett in Victoria Embankment Gardens in London, and Market Place in Salisbury, on English Heritage’s list of designated assets. It is sad that the Council at that time did not respect or care for the monument, resulting in its premature demise and depriving future generations the chance to appreciate its beauty. However, we should remember that, in many ways, the true memorial and lasting testament to both Fawcett and his legacy was never really the monument, but Vauxhall Park itself. Terry Cavanagh, Public Sculpture of South London (Liverpool, Liverpool University Press, 2007), p. 372. Leslie Stephen, Life of Henry Fawcett (London, Smith, Elder & Co, 1885), p. 20. Ross Davies, Vauxhall: A Little History (London: Nine Elms Press, 2009), p.48. ‘Opening of Vauxhall Park’, The London Illustrated News, 12 July 1890, p. 39. ‘Our Illustrated Notebook’, Magazine of Art, Vol 16, 1893, p. 180. 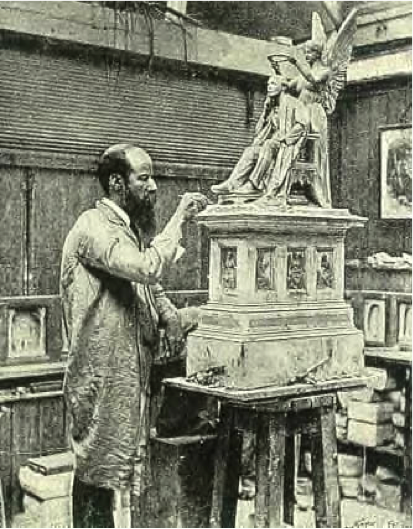 ‘Memorial Statue of Mr. H. Fawcett’, Illustrated London News, 10 December 1892, p. 758. ‘Our Illustrated notebook’, p. 180. London, Lambeth Archives, Lambeth Council Minutes 1958-1959, MCB/CI/58, LVIII, p. 762. South London Press, 20 February 1959, clipping, page unknown. Lambeth Council Minutes, p. 762.